We rise at the crack to meet with MBARI's Dave Field, our giant blond oceanography tour guide, who escorts us to the Instituto del Mar del Peru (IMARPE)—the military-run marine regulation and research center at the national port in Callao. The IMARPE building is circumscribed by a fence and friendly guards who called Robin and me "bebita." From the top floor of the building we can see that we are on a peninsula. To the north, an idle anchovy fleet:The fishermen have reached their quota until next season. An IMARPE scientist tells me anchovies represent 90 percent of Peru's catch by weight, and Peru has the most productive fishery in the world. That's a lot of Caesar salads. To the west, a historic fort tells the story of Peru's battles with Spain (the 1865-1866 war over lucrative bird poop on the Chincha Islands) and Chile (the 1879-1883 War of the Pacific, which cultivated a bitterness that 125 years later manifests in arguments over the claim to pisco, an alcohol the Peruvians invented but the Chileans mass-marketed). To the south, the poor and middle-class neighborhoods are visibly divided. On one side: the nicely manicured park and a charming trail along the water. Nasturtium flowers crawl up palm trees and an out-of-place rhino sculpture grazes in the dirt. Guards patrol on bikes, keeping a protective eye on us gringas in particular, and schoolkids in indigo uniforms crowd around a daffodil-yellow snack cart. Garbage literally delineates the neighborhood so bad that a guard runs after Robin as she wanders over the line in deep focus. Lima's untreated sewage is discharged into the ocean just a few kilometers up the Costa Verde, I learn, and only the locals with fortified guts can eat the parasite-riddled fish baited in these waters. Loving your updates Kera :) Please don't eat any fish! Yeah I'm with Carrie...no Bubble Guts for Kera. Stay Safe. Hopefully some of the locals are planning on participating in the internationally recognized Coastal Cleanup Day! 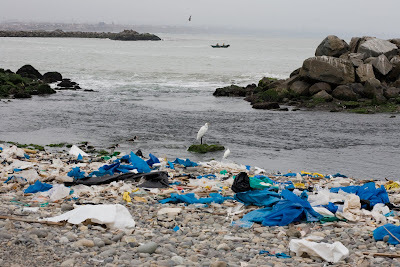 That photo of garbage is shocking and reminds me how lucky I am to live in California, where there is already so much awareness about the importance of clean water, clean oceans and pollution prevention. Thanks for traveling to do this story Kera and inform the rest of the community upon your return. Good photo Robin. Thanks for traveling with Kera. Both of you keep away from the caesar salads. Love you and miss you.